Our small group tours promise more than just a holiday of tacky souvenirs and blurry photographs. We strive to go beyond all things touristy and tame by venturing down the road less travelled, mingling with the locals and truly discovering new cultures and traditions. You will return home with not only a diverse array of experiences under your belt but also a significant sense of enrichment and a better understanding of the destination that you visited. When travelling with us you are not just another sightseer trying to tick off a list of guidebook suggestions. Instead, you will tour a country as an avid explorer, seeking out the unknown on a remarkable adventure. The hotels and accommodations listed below are the ones we most often use on these tours. From time to time we may exchange these for similar properties at the same level. In general, specific hotels cannot be guaranteed on our group tours, but you may select your preferred options if you are booking a tailor-made trip. Vietnam's air-conditioned trains are safe, comfortable and a genuine Vietnamese experience in themselves, an integral part of your visit to Vietnam. Each carriage has its own steward who ensures the train is kept clean and tidy. You will stay in a 4-berth cabin with 3 other passengers. If you are travelling as a couple or family, supplements can be paid to book all 4 seats and have the cabin to yourselves. Bedding is provided onboard the train. The berths are on two tiers and we cannot pre-book lower tier berths. A ladder is provided but you therefore need a reasonable degree of mobility to climb up to the top tier berths. When travelling in a group, we cannot guarantee that everyone in the group will be seated together in the same cabins. However, the train stewards are generally very helpful at arranging seat swaps, and the local travellers on the train are friendly and interesting to talk to during your journey too. This newly built wooden junk boat is designed in the traditional style, but with contemporary, deluxe cabins and facilities, including sea-view windows in each AC cabin, private, modern bathrooms, and a comfortable sun-deck bar. The newly built V'Spirit wooden junk boats are designed in the traditional style, but with contemporary, deluxe cabins and facilities. These include air-conditioned cabins with sea-view windows, moden en-suite bathrooms, and a comfortable sun-deck with loungers and a bar. Delicious food is prepared and served on board, and is based around the fish and sea-food of the bay. You can even do some fishing for squid while on board. Other activities available on board include morning Tai Chi, massages, cooking demonstrations, and kayaking and fishing equipment is available. Life jackets and safety equipment are carried on board. Travelling by train in India is a great way to see and experience more of the country on one of the worldâ€™s most extensive railway networks. On our small-group tours we aim to book seats in the AC2 class (2nd class air-conditioned carriage). Travelling by train in India is a great way to see and experience more of the country on one of the world’s most extensive railway networks. On our small-group tours we aim to book seats in the AC2 class (2nd class air-conditioned carriage). This is relatively clean, comfortable and not overcrowded. You get a padded seat during the day which the carriage steward will convert into a flat padded bunk with pillows, sheets and blankets in the evening. There are no separate self-contained compartments, with the layout more open plan with curtained bays of four bunks on one side of the aisle (two upper and two lower) and two arranged along the wall of the carriage across the aisle from there. Meals and drinks are available on board. Due to the huge distances some trains cover, Indian trains are subject to delays and on an overnight journey of around 12 hours a delay of an hour is not unusual. Delays can be longer in the winter months if the weather is foggy. Tickets are issued 120 days in advance and are subject to full cancellation fees after you have arrived in India (US$10 up until that point). If you book within 120 days of departure we cannot guarantee that you will be allocated a berth next to other people in the group, though the carriage stewards are generally very helpful in arranging to swap you with another traveller. Flight upgrades are available on some journeys on request. Hotel Surya in Varanasi is a heritage style hotel, originally built by King Kaiser of Nepal in 1818. The location is good, with other shops and restaurants close by, and easy access into the centre of the city. Hotel Surya in Varanasi is a heritage style hotel, originally built by King Kaiser of Nepal in 1818. The location is good, with other shops and restaurants close by, and easy access into the centre of the city. The hotel has a pool, lawned gardens, and full service spa. Rooms are en-suite, air-conditioned and recently renovated. This is a Japanese funded and designed hotel that maintains a strong Japanese influence including precisely laid out gardens and 20 Japanese tatami style rooms, as well as 7 western style rooms. All have en-suite bathrooms and air conditioning. This is a Japanese funded and designed hotel that maintains a strong Japanese influence including precisely laid out gardens and 20 Japanese tatami style rooms, as well as 7 western style rooms. All have en-suite bathrooms and air conditioning. Food is good, with Japanese, Chinese and Nepali offerings. The hotel also has a good location close to the Lumbini Monastic Zone. Offering a restaurant and a terrace, Bardia Eco Lodge is situated in Bardia. Bardia National Park entrance is 550 yards from the property. Free WiFi is provided. Each room has a seating area. The private bathroom comes with shower. The room overlooks the garden. An array of activities like elephant safaris, jungle walks, jeep safaris, village walks, birdwatching, trekking, river rafting and fishing can be enjoyed at Bardia Eco Lodge. This 4-star hotel is found in the centre of Kusadasi, directly across from the main beach promenade. It offers views of the Aegean Sea from its roof terrace and some of the rooms. It also features a rooftop pool and bar, conference rooms. Ilayda Avantgarde is a 4-star hotel located in the heart of Kusadasi. It is right across from the main beach promenade and provides ocean views from the rooftop terrace and several rooms. Facilities include a Starbucks coffee shop, conference rooms, and a rooftop bar and pool. The rooms feature all amenities needed for a comfortable stay. This is a friendly local homestay in Rasoun village near Ajloun Castle. Accommodation is in shared rooms holding up to 4 people. Bathrooms are separate and shared. Overall you can expect a simple but comfortable and very welcoming experience. This is a friendly local homestay in Rasoun village, near to Ajloun Castle and the RSCN's Ajloun Forest Reserve. Accommodation is in shared rooms holding up to 4 people. There are a number of homes in the village that will accommodate guests, so depending on our final group size we may split across several houses. We will all eat together in one house with the hosts. All beds and bedding are provided. Bathrooms are separate and shared but quite basic. Overall you can expect a simple but comfortable, and very welcoming experience with good food and interesting insights into local village life in rural Jordan. The RSCN's Soap House is also nearby and worth a visit. Here local women use a variety of local natural ingredients, including lavender, geranium, mint and pomegranate, to create high-quality handmade natural olive oil soaps. The Dead Sea Spa hotel is a comfortable resort style hotel located on the banks of the Red Sea. Access to the Dead Sea itself is directly from the hotel, with spa treatments and Dead Sea mud to lather yourselves with before swimming also available. The Dead Sea Spa hotel is a comfortable resort style hotel located on the banks of the Red Sea, around 1 hour's drive from Amman and Amman airport. There are several pools, and the hotel has great direct access into the Dead Sea itself, with the famous Dead Sea mud available on the beach to lather yourself with before swimming (if you wish!). Various treatments are also available in the hotel spa. Meals are generally buffet style with a good selection of different options including several vegetarian options. There are more luxurious 5-star resorts on the Dead Sea, but we feel the Dead Sea Spa hotel provides an very good mid-range option, ideal for short stays. This Wadi Rum desert camp has a fantastic location on the desert sands against the cliffs in the Wadi Rum Protected Area. Accommodation is in permanent goat hair tents with proper beds and all bedding provided. The food is generally excellent. This Wadi Rum desert camp has a fantastic location and setting on the desert sands right up against the cliffs within the Wadi Rum Protected Area. We like it for its spectacular and remote location well away from the main road, and for the excellent food and friendly welcome the Bedouin hosts always provide. Accommodation is in permanent traditional goat hair tents with proper beds and all bedding provided. We book the standard tents with shared bathrooms, though some en-suite tents are also available and subject to availability you can upgrade to these locally if you wish. You can also bring a sleeping bag if you wish, and find a sheltered spot on the rocks on the edge of the camp and sleep under the stars. WiFi is available throughout the camp. Meals are traditionally cooked, with a delicious underground 'BBQ' prepared nearly every night. Alcohol is not available. Sunrise and sunset camel rides are available to book locally (around US$30). Antika Hotel is located in the heart of the old city of Amman and offers simple but comfortable accommodation. This characterful hotel is perfect for your last day in Amman, unlike other hotels further from the city centre. Antika Amman Hotel is located in the heart of the old city of Amman; on the edge of Rainbow Street which has many restaurants, cafes and shops along it. It is also within walking distance from Downtown Amman. All rooms have en-suite bathrooms and flat-screen TVs. Certain units include a seating area for your convenience. Guests can enjoy the on-site snack bar. There is a 24-hour front desk and gift shop at the property. You can also enjoy free WIFI during your stay. While this is a fairly simple hotel, the family owning it are very friendly and helpful to guests, and the location close to the centre of town is very good. The Al Waleed is rare in Amman in that it is a decent mid-range hotel located within easy walking distance of lots of shops, cafes and restaurants. This is ideal if you have any free time before or after the main tour, and also in the evenings. The Al Waleed is rare in Amman in that it is a decent mid-range hotel within easy walking distance of lots of shops, cafes and restaurants. The hotel is located in the Sweifieh district, just a few setps away from Wakalat Street which is very popular with Jordanians for shopping and eating. The location is ideal if you have any free time before or after the main tour, and also for going out to eat in the evenings. Unfortunately nearly all other 3 and 4-star hotels are situated in more obscure areas and on main roads with nothing much around them, meaning you either need to eat in the hotel or take taxis if you want to explore during your free time. Rooms are comfortable and all en-suite and air-conditioned. There is a good Italian restaurant on the ground floor. Offering free Wi-Fi, all the air-conditioned guestrooms enjoy views of the gardens, pool or city. A flat-screen TV, free fruit basket and free tea/coffee making facilities are included. En suite bathrooms are equipped with a bathtub. Saem Siemreap Hotel is 4.3 miles from Siem Reap International Airport. It is a 15-minute drive from the World Heritage Site of Angkor Wat Temple. The Silver Restaurant serves both Asian and Continental dishes, while The Ruby Lounge offers cocktails and spirits. Enjoy high tea at the Lobby Bar, as well as snacks at the Pool Terrace Bar. Featuring a rooftop infinity pool and a sun terrace, Harmony Phnom Penh Hotel is within a 5-minute walk from the Royal Palace. Guests can enjoy meals at the in-house restaurant or have a drink at the bar. Featuring a rooftop infinity pool and a sun terrace, Harmony Phnom Penh Hotel is within a 5-minute walk from the Royal Palace. Guests can enjoy meals at the in-house restaurant or have a drink at the bar. Free WiFi is available throughout the property. The property is just 550 yards from the Riverfront Park, while Wat Phnom and Chaktomouk Conference Hall 2 are 0.6 miles away. It is 2.4 miles to Aeon Mall. Phnom Penh International Airport is 5.6 miles from Harmony Phnom Penh Hotel. Fitted with parquet flooring, air-conditioned rooms open up to views of the city. The seating area is fitted with a flat-screen TV, minibar and a desk. En suite bathrooms include shower facilities, a hairdryer and free toiletries. Guests can approach the 24-hour front desk for currency exchange, business facilities and concierge services. A fitness centre is available for working out or guests can indulge in in-house spa treatments. The in-house restaurant serves a selection of local dishes, along with a wide variety of drinks. Room service options are provided for guests' convenience. Housed in an 11-storey building, Romance Hotel offers 4-star accommodation and a beautiful rooftop swimming pool in Hue city, a UNESCO-listed World Heritage area. Featuring 2 on-site restaurants and 3 bars, it is within walking distance to the scenic Perfume River. All ample rooms come with air conditioning and large windows offering plenty of natural lights. Magnetic locks, a cable flat-screen TV and minibar are included. Selected rooms have a spa bathtub and/or seating area. Attached bathroom is equipped with shower facility and a hairdryer. Extras include bathrobes, slippers and free toiletries. Dong Ba Market and Truong Tien Bridge are within 0.6 miles from the hotel, while Dieu De National Pagoda is 0.9 miles away. Operating 24-hour front desk, guests can enjoy soothing massage at Romance Spa, or have a good work out at the fitness centre. Located on the first floor, Lucky Plaza serves an array of Vietnamese, Asian and European cuisines. Guests can enjoy international buffet breakfast at Romance Restaurant on 11th floor while enjoying views of Perfume River and sunset. Guests can also unwind at Rendez-vous Bar & Cafe, which have a selection of alcoholic drinks and beverages. La Dolce Vita is a small hotel on a bustling narrow street in the heart of old Hanoi, 3 minutes from Hoan Kiem Lake, about 30-45 minutes drive from the airport. The staff are excellent, rooms are a decent size and quiet, despite the busy location. La Dolce Vita is a small hotel on a bustling narrow street in the heart of old Hanoi, only 3 minutes walk from Hoan Kiem Lake and 30-45 minutes drive from the airport. There are lots of shops, cafes and eating places very close by. The hotel staff are friendly and helpful. The rooms are a decent size and quiet, despite the busy location. Overall we find this a good mid-level option in central Hanoi. Kim An is a quiet, well located hotel with great friendly staff, clean rooms, a pool, and nice touches like free umbrellas, bikes and cooking classes for guests. It is 5 minutes walk to the Old Town, and 10 minutes by bike to An Bang beach. Le Duy is a small 20-room hotel in central Ho Chi Minh city. The location is ideal if you want to be in the heart of the city, with plenty of good eateries on the doorstep, a park across the road, and various markets nearby. This homestay on Kulen Mountain offers comfortable but simple accommodation set in a beautiful scenic setting. You'll have an opportunity to experience the day to day life of rural Cambodia as a guest of a warm and friendly local family. Facilities are basic, but comfortable enough with beds, pillows and bedding provided and separate shared bathrooms/toilets. The food is home cooked and simple but tasty (you can assist with preparation and cooking if you wish). Subject to availability and numbers, other similar homestays in the near vicinity may also be used. Hai Dao is a local homestay in the Vinh Long district of the Mekong Delta. Facilities are basic with some private and some dorm rooms separated by curtains. There are fans but no AC. The welcome is friendly, the food good, and internet is available. This homestay in the Mekong Delta is a friendly and welcoming place. Facilities are basic, but comfortable enough with beds, pillows and bedding provided and separate shared bathrooms/toilets. There are both private and dorm rooms with curtains and fans but no air conditioning. The location is good with a nice garden near the river. The food is home cooked and good (you can assist with preparation and cooking if you wish), and internet is available. The Xenophon Hotel is a comfortable mid-range hotel located close to the heart of Athens, just 3 miles from Syntagma Square. Around 200 metres away, the Metro offers easy access to the Airport, Piraeus Port and the city centre. The Xenophon Hotel is a comfortable mid-range hotel located close to the heart of Athens, just 3 miles from Syntagma Square. The nearby Metro also offers easy access to the Airport, Piraeus Port and the city centre. All 186 rooms at the Xenophon Hotel feature wooden furnishings along with balconies, LCD TV's, private bathrooms and free wifi. The Antoniadis Hotel is located in Kalambaka, the gateway to Meteora. Just 3 miles from the Monastery of Agia Triada and 12 miles from the Theopetra Cave. Just a few steps from the hotel youâ€™ll find a selection of shops, restaurants and cafes. The Antoniadis Hotel is located in Kalambaka, the gateway to Meteora. Just 3 miles from the Monastery of Agia Triada and 12 miles from the Theopetra Cave. Just a few steps from the hotel you'll find a selection of shops, restaurants and cafes. All 98 rooms include TV's, en-suite bathrooms and balconies. The hotel also has an on-site restaurant, bar and swimming pool. Located in the very heart of Tirana, overlooking Scanderbeg Square, the Tirana International Hotel has an enviable position with most of Tirana's attractions within walking distance. Located in the very heart of Tirana, overlooking Scanderbeg Square, the Tirana International Hotel has an enviable position with most of Tirana's attractions within walking distance. Nearby attractions include Scanderbeg Square, Et-hem Bay Mosque, St Pauls Cathedral, the National Historical Museum and the abandoned Piramida. All 170 guest rooms feature en-suite bathrooms, free wifi, LCD tv's and minibar. The hotel also offer a wide range of facilities including 2 restaurants, full service spa, fitness centre, bar and an indoor swimming pool. Located on the banks of the Bay of Kotor in the small town of Prcani, the Hotel Splendido offers guests basic but comfortable rooms many of which feature incredible views of the bay. Rooms at the hotel Splendido are traditionally furnished with air conditioning, satellite tv and include internet access. The hotel also features a beautiful outdoor pool area and a small private beach, whilst the on-site restaurant specialises in seafood platters and traditional Montenegrin dishes. Located on the beautiful Babin Kuk peninsula, the Valamar Club offers easy access to the beach and the famous walled city of Dubrovnik is just a short 10-minute bus ride away. Rooms at the Valamar Club feature all modern amenities including free wifi, satellite tv, hairdryers, safes and en-suite bathrooms. The hotel also includes a plethora of facilities including the large swimming pool, sports courts, snack bar, restaurant and bar. The modern Hotel As is in Kopilica, the business area of Split. The beautiful Old Town is just a 5 minute taxi ride or 30 minute walk away. At the hotel you'll 33 fully equipped rooms all featuring free wifi, satellite tv, minibar and en-suite bathrooms. On-site you'll find a bar and restaurant offering tasty local food. Located in the centre of Sarajevo in Bascarsije, an area known for its Ottoman architecture. All major tourist attractions are within walking distance and you'll be spoiled for choice with a multitude of shops and restaurants on your door step. The Hotel Astra is located in the centre of Sarajevo in Bascarsije, an area known for its Ottoman architecture. All major tourist attractions are within walking distance and you'll be spoiled for choice with a multitude of shops and restaurants right on your door step. The hotel offers 17 air-conditioned rooms featuring satellite tv and minibars. Also at the hotel you'll have access to free wifi in public areas and a restaurant where local Bosnian cuisine is served. The well-reviewed 88 Rooms hotel is a lovely modern hotel just 700 metres from the centre of Belgrade and close to a good selection of shops, bars and restaurants. Rooms at the hotel are modern and comfortable with free wifi, satellite tv, air-conditioning, tea and coffee making facilities and a minibar. The Best Western Hotel Turist is located in the very heart of Skopje just a few paces away from the famous Mother Teresa House. Macedonia Square with its huge Alexander the Great statue and a short walk from the Old Bazaar and stone bridge. The Best Western Hotel Turist is located in the very heart of Skopje just a few paces away from the famous Mother Teresa House. Macedonia Square with its huge Alexander the Great statue is just 300 metres from the hotel and the Stone Bridge and Old Bazaar around 500 meters. Rooms at the Hotel Turist are comfortable with air-conditioning, tv and en-suite bathrooms. Some rooms also feature balconies with lovely views towards the Mother Teresa house. The Hotel Belvedere offers comfortable accommodation just 2 minutes walk from the clear waters of Lake Ohrid, a great place for relaxation and a swim in the cool waters. The beautiful centre of Ohrid is just 2.5 miles away. The 89 rooms offer lake or forest views and feature air-conditioning, satellite tv, minibar, en-suite bathrooms and private terraces. We highly recommend visiting the centre of Ohrid in the evening, however if you prefer to remain at the hotel you'll find a selection of restaurants offering a good choice of cuisine. The A.D Imperial Palace is located in the very heart of Thessalonikis historic city centre and most of the citys famous landmarks are within short walking distance. The cosy rooms are decorated in an opulent neoclassical style with all modern facilities such as free wifi, satellite tv and air-conditioning. There is also an onsite restaurant and bar. La Maison is a comfortable, mid-range hotel in Petra with an excellent location less than ten minutes walk from the Visitor Centre and entrance into Petra. La Maison is a comfortable, mid-range hotel in Petra with an excellent location less than ten minutes walk from the Visitor Centre and entrance into Petra. The 76 en-suite rooms have been recently rennovated and all ll have air conditioning, free internet and TVs. The hotel has a lobby lounge and bar, a restaurant and an Arabic styled roof terrace where you can enjoy traditional Jordanian snacks, drinks and shisha pipes. Al Fanar Palace Hotel is a family-owned and operated hotel located in the heart of classy modern west part of Amman, the capital of Jordan. Guests can enjoy a fusion of Jordanian specialities and international classic dishes at the restaurant of the hotel. Guests can enjoy shisha in the outdoor covered terrace all year round. Amman's Old Town is famous for its traditional food stalls and is 4.3 miles away. All guest rooms are luxuriously furnished, and equipped with self-regulated climate control units and outlets for computer and fax modems. Titania Hotel's rooftop Olive Garden Restaurant serves Greek and Mediterranean dishes, along with a stunning panorama of the Acropolis, the Lycabettus and the city beyond. La Brasserie Cafe Restaurant proposes light Mediterranean dishes for lunch or dinner. The Acropolis, the University and the Academy of Athens, the National library, and the Greek Parliament are within easy walking distance of the front door. Cafe and bars surround the hotel. Titania is 18.6 miles from the Eleftherios Venizelos Airport. The hotel is 15 minutes walk from Syntagma. Set on a slope of Mount Parnassus, at the exit of Delphi town, Amalia offers a panoramic view of the green valley, all the way to the sea, Itea and Galaxidi. Open year-round, it features an outdoor pool and an inviting lounge with fireplace. Set on a slope of Mount Parnassus, at the exit of Delphi town, Amalia offers a panoramic view of the green valley, all the way to the sea, Itea and Galaxidi. Open year-round, it features an outdoor pool and an inviting lounge with fireplace. Free WiFi is available throughout. The modern guest rooms have natural light, through windows, terraces or balconies, and are air-conditioned and heated. Most offer impressive views to the valley and the sea and some to the internal gardens. Guests can relax at the lobby lounge with fireplace and admire the breathtaking view of the Delphian scenery. One level down, the restaurant overlooks the valley and the pool, surrounded by the green gardens. A rich American buffet breakfast is served here. Amalia Hotel Delphi is just minutes away from the archaeological site of Delphi and the museum, the temple of Apollo and Castalia spring. Arachova is 6.2 miles away from the hotel, and is renowned for its traditional woolen weavings and gastronomy. Also Itea and Galaxidi, are port towns worth visiting in close vicinity. The Amalia Hotel Nafplio is a good 4-star hotel located on the edge of town with 170 rooms and large green gardens full of flowers and palm trees, with orchards around it. Taxis are easily arranged for transport in and out of the centre of town. The Amalia Hotel Nafplio is a good 4-star hotel located on the edge of town with 170 rooms and large green gardens full of flowers and palm trees, with orchards around it. The hotel has a cafe by the swimming pool (the pool is open from May to September) and a bar and lounge with a fireplace for cosy winter nights. Taxis are easily arranged for transport in and out of the centre of town (approx. EUR 6-7). Rooms are large and comfortable with a mix of sea and garden views. The hotel has also been awarded the Green Key, from the Greek society for the protection of nature, acknowledging the hotel group's efforts in the use of eco friendly technologies and products. The contemporary Divani Meteora Hotel is located in Kalambaka, just a short distance from the Monastery of Agia Triada and the Theopetra Cave. The contemporary Divani Meteora Hotel is located in Kalambaka, just a short distance from the Monastery of Agia Triada and the Theopetra Cave. At the hotel you’ll find a full-service spa, restaurant and indoor swimming pool. Kalambaka town is just a short walk from the hotel. Rooms at the hotel come equipped with modern amenities including air-conditioning, satellite tv and minibar. This large hotel is found in the Istanbul city centre, near Karakoy and the Galata Tower. It has 111 rooms of different types, some with river views and some family-friendly. This large hotel is found in the Istanbul city centre, near Karakoy and the Galata Tower. It has 111 rooms of different types, some with river views and some family-friendly. All feature air-conditioning, satellite TVs, a kettle and free toiletries. Hotel facilities include a rooftop terrace, restaurant and bar, free WiFi and free parking. This 4-star hotel is made up of three restored Greek mansions known as the â€œRose Mansionsâ€. It is found in one of Cappadociaâ€™s oldest villages, and features two restaurants, a bar, free WiFi, 24-hour room service, and ticketing/tour assistance. This 4-star hotel is made up of three restored Greek mansions known as the “Rose Mansions”. It is found in one of Cappadocia’s oldest villages, and features two restaurants, a bar, free WiFi, 24-hour room service, and ticketing/tour assistance on site. The 19 rooms are air-conditioned with TVs, phones, hairdryers, and free bottled water. This hotel is situated in a convenient location in central Konya, within walking distance of historical and cultural sites and 20 minutes from the airport. This hotel is situated in a convenient location in central Konya, within walking distance of historical and cultural sites and 20 minutes from the airport. Its facilities include a restaurant, convenience mart, business centre, fitness centre, and meeting space for up to 500 guests. Rooms and suites are comfortable and feature TVs, fridges, and complimentary WiFi. Other than the hiccup with the hotel on the first day, the tour itself was excellent. Our guide Yuksil was great - very helpful and knowledgeable. Really well organised and run. The tour was fantastic. The guide and the driver were friendly and accommodating. The places that were seen were brilliant. Only issue was to try and cram 8 adults into one 4 WD to go to the Sahara was NOT comfortable. Those in the "boot" had no leg room and heads were hitting the roof with every bump. Would have walked if it wasnt for the distance. The guide advised we should have had 2 4WD's and didnt know why only one was available. Apart from that would love to go back and travel more in depth especially Fez and Marrakesh. Provided a bunch of feedback to Fez Travel at the end of the tour but will give the cole's notes: - Was confused when we got into town because the tour was not called "Turkey Encounters" as we purchased but instead "Flying Carpet Tour" run by Fez Travel not Encounters Travel. - Tour guides were not the ones advertized on the Encounters website but one of Fez' guides. -Guide was very personable and helpful so far as helping is with what we needed. His English was good enough to this extent however when it came to relaying historical backgrounds of the sites we were visiting his English was only "adequate". He tended to tell us everything he knew (or could communicate) up front and then send us to roam the grounds on our own. I was a little bit envious of some of the tours who had native English speaking guides who were going into more details; especially where dealing with ruins like Ephesus, Aphrodisias, etc. - On the flip side the local guide got us places I am not sure we would have otherwise visited (i.e, cave family's house). - Some of the visits to the craft industry shops were awkward. The fashion show / leather stop was out of place (i.e., nobody was interested, the fashion show was a bit contrived, and the sales tactics were a bit agressive given nobody showed any interest in leather). - All of the hotels were excellent with the exception of one. The Best Western Khan in Antalya does not belong in a higher priced "comfort" tour. It is old and run down. It was the only hotel in which we were given separate beds as a married couple. It also seemed odd that the Istanbul (TRYP by Wyndham) gave us a large room with a nice view on our initial visit (starting the trip) and then a very small room with no window at all on the night before we left (almost as if they were trying to impress us on the way in but it didnt matter so much on the way out after the Fez feedback had already been provided). As a sidenote, the whole selection of Antalya as a two day stop seems poor. There was very little to do in this town and it seemed like more of a stopover required as a result of the time required to get to the next stop in Capadoccia. - The optional visit to the Turkish bath needs to be better vetted by the tour company and Encounters. The place we were taken to seemed a bit unsanitary and run down. I think we went here because the tour guide knew the family. This should not be a reason for selection of a location. *** - They did not properly separate them men from the women and one of the girls ended up being bathed by one of the male attendants... we were told later that the man was noticably aroused by this exchange which was reported to the tour guide. The tour guide apparently returned and the attendant was summarilly dismissed. I did not let it impact my rating of the tour as the latter bit didnt impact me personally or my wife (other than the cleanliness part) but the fact that that choices in these places is left up to the nepotism/cronyism of specific tour guide is HIGHLY questionable. I would never do something like this again unless it was at a new, clean, and highly rated establishment that I pre-vetted. Sadly I was not given the option to check the location in advance. - Our bus broke down a couple of times over the course of the tour. Once due to flat tire and once because I believe the clutch or gearbox needed servicing. These resulted in delays and unexpected stops in our itinerary. - We skipped Ankara as the guide asked us to vote on whether we wanted to get into Istanbul early. We voted for this since we had an early flight the next day. They seemed a litle rushed to get rid of us that day though. I have brought up a lot of constructive items here but I want to be clear that we did really enjoy the trip and the guide worked very hard to make the tour a good one for the rest of us. The tour was a good mix of organised activities and time to relax or do our own thing. The jungle trek was amazing. Hotels were reasonable for the price. One thing I would suggest is that for the days after the night train journeys that an early check in could be arranged at the hotel as it was it was hard to just keep going until the afternoon having had little sleep and not being able to have a shower or change of clothes. or book travellers into a first class train carriage where they are more likely to get a reasonable nights sleep. My guide did not speak great English and really didn't do much more than guide me through the hike....he didn't explain much unless I asked and he spent most of the time talking in Nepalese to the porter, who did not speak any English. It was at times lonely. Also, when I compare what other guides did and how involved they were with their groups it was hard not to notice how mine were inexperienced. They were kind, just rather uncommunicative is all. Overall very good, but at times a bit haphazard. The enthusiasm level of the group participants varied widely, by person and over time, in part for that reason. Some explanations of what was going on would at times have been helpful, despite it all working out okay. Very good tour guide, visits and most hotels good. Absolutely amazing. Our guide and his team were fantastic and I would definitely recommend trekking with them. Could have easily done it without a guide for a lot less money and no issues around safety. My Egyptian tour was the trip of a lifetime, The Egyptian and Nubian people were friendly and welcoming. The food and hotels were fantastic and the country of Egypt was stunning!!! All the sights were great and our tour guide explained and told History on all we saw. The tour for the price was EXCELLENT! Bucket list experience. A must. Amazing value for the price. We loved our guide, Big Mo! See above review for more details. Incredible trip; our guide was really knowledgeable and answered all questions regarding history. Great tour! Safe, comfortable, and fascinating. It was a joy to travel to so many wonderful places and always know I was in good hands. Amazing trip. It was well layed out and guided. We also we're lucky to have a great group in which we all got along really well. Price was excellent! Very affordable for 2 people. The tour was exceptional for the price I paid. Really saw and did so much. Prices were great. Our US dollar went a long way. Did not like the overnight train, but enjoyed everything else. We did not spend the night on the sail boat, but enjoyed sailing in the afternoon and retuning to the hotel. Very well organized with knowlegable guide. Sights coverd and seen breath taking. Total enchament. Good value for price just be aware of additional tours. I've traveled extensively and never had a better trip. They met my son and I at the gate coming off the plane and stayed with us til we were at our gate leaving and everything in between. Sheriff was an excellent guide and much fun. I can say I will never go back to Egypt because I was shown everything I wanted to see and more, and I was expecting a lot. Completely satisfied! Egypt is a safe place to travel now and your crazy not to book this trip. The Egyptian people are friendly and fun. You will thoroughly enjoy it. The time spent with the locals was the most enjoyable portion of the trip. I feel there was entirely too much packed into a short amount of time. The vacation felt more like a school trip as opposed to a vacation. I did not enjoy the 4-5am wake-up calls and obligations during vacation. All I know is Sheriff was one fabulous interesting, educational guides I will ever encounter. The choices of sites could not have been better. Got to see most the main sites. An amazing experience! Great for the adventurous at heart! Was wonderful to see all of the sites, would have preferred a little less time on the falucca and perhaps Abu Simbel being included. I could not have wished for a better introduction to Egypt than Encounters Travel/Egypt Uncovered tour. 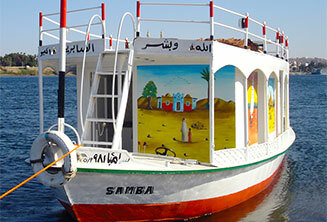 The Egypt Experience tour is very comprehensive, excellently designed and efficiently ran by the local staff. Accommodation included in the tour is superb; the tour guides are knowledgable and enthusiastic; all key sites that should be visited on a first trip to Egypt are included in the package; and local travel runs extremely smoothly. Moreover, enjoying a private tour of such quality has made of this trip an unforgettable experience that I hope to repeat soon. Thoroughly recommendable! There is room for improvement on the Nubian adventures. Maggs our guide was low key, knowledgeable and fun to be with. I would insist on using him. Abdul our driver was always there, safe and worked hard. Using Egyptian Encounters MADE the experience!! 100% couldn't have been better. Superb guides, good hotels. Tatty room on the boat but after complaining got a different one. Fantastic tours and guides with good knowledge - the holiday does go at a pace however, to get everything in - no lie-ins if you really want to see everything! Egypt is a place I wouldn't really want to negotiate/navigate through on my own - Encounters saved a LOT of time and stress. I found our guide to be very good. I did think the extras we had to pay for where ridiculous. I have read the documents again and it reads as if our Abu simbel trip is included and we only have to pay entrance fees but in the end we have to pay 65 pounds for this trip. I enjoyed the way the Jordan portion was organized but Cairo was lacking. Next time I would like to shorten the time spent in Cairo and extend more in Jordan. We had knowledgeable tour guides who really gave us a the context within which to visit the ancient sites. We were there during the off season, so much less crowded but operating hours for the sites were shorter. Meals and accommodations were all good quality. Hotels and amenities were great. Ours was a small tour group which made it much better because we were older and would have slowed down a large group. Loved, loved, loved this tour. Everything was top notch. The accommodations, the sights, the people. Wonderful trip made even more enjoyable by efficient arrangements and a very informative and helpful guide. Sights were great. Easy way to see Jordan and safe. Well worth the money! We would use Encounter Travel again! Amazing and surreal. We found the gorillas within an hour and the experience of being up close and personal with gorillas is a once in a life time adventure. Bolivia is fantastic, such an amazing country and stunning landscape! The tour was good fun and had a wonderful rage of activities and good accommodation. The hotel in Sucre was lovely. Be aware that on the 3 day salt flat trip it gets really cold and the accommodation, as stated is basic. We could have done with a bit more tuition/ advice on how to take the photos on the salt flats as ours were not really successful. Marco was a very knowledgable guide and knew of some good places, but could have imparted some essential information in a more timely manner (eg on climate conditions/ the need for a torch etc). Overall it was a spectacular place to be! Encounters Travel arranged for us the trip of a lifetime. I would look at changing some of the hotels. A lot are outdated and need a massive makeover. Except the first day of arrival without giving a briefing about the meeting time and gathering spot, everything else was excellent. I was a little bit lost on my first day of arrival and had to ask the hotel front desk about what time I should come down the next day to meet my group. If there can be a debriefing session, that would be nice. For the Egypt part - shout out to Aboudy, the best tour guide ive ever experienced! His passion and care made the trip! The tour on the whole was fantastic hotels were well above what was expected for the price paid the sites were amazing and the guide was knowledgeable but i did feel he rushed through things a bit compared to other tour guides I've encountered in the past. Unfortunately the tour was totally let down by the desert camp experience we were virtually abandoned at a so called desert camp at 11am with no tour vuide nobody who spoke English told us what was happening or what to do. At no time were we offered any excursions ie camal ride as stated in intinery. It was a complete waste of a day sleeping unxer the stars could of made up for it if we weren't next to a busy road. I definitely wouldn't recommend the desert night. However the rest of the tour and Jordan are spectacular. The itinerary was limited and needs reviewing, particularly considering the cost of the trip. It could have been covered in a shorter, but busier trip and with slight adjustments to timings each day. Travel days could also include more activities. We booked this tour because we wanted to join a group and the dates fitted in with our plans but we were the only ones. Had we known this we would have looked more closely at itinerary to ensure trip matched our interests better. We did not get all our meals as specified. When we did the meals were very low budget and equal to street food. The structure of the tour was great and very well paced, pickup at the airport/ drop off were amazing and the hotel in Petra was amazing. The only reason I am not giving it an Excellent rating is the hotel in Amman, which was 1 star at best - for an "on a shoestring" tour I wasn't expecting 5 star, however I truly felt unsafe in the hotel in Amman.